A Uniquely Designed Folding Funnel Bowl For Your Pet. Giving your pet water on the go has never been this easy. This unique water bottle and pet bowl is perfect for hiking, camping, taking to the beach, for walks or any other time your dog gets thirsty away from home. This canteen is cleverly designed to feature a fold out bowl that makes watering your pet and conserving left over water easy. The ingenious design allows for quick clean-up too. The bowl locks into place, forming a funnel between the canteen and water bowl. This feature not only makes it easy to pour water in, but also just as easy to pour unused water back in. This is truly a must-have product for road trips or outdoor adventures with Fido! 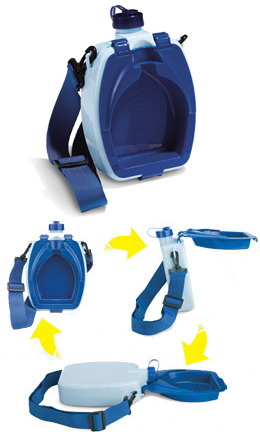 The bowl also easily detaches, allowing the canteen to be used as a second bowl, giving you a food and water bowl. The Hydro-Go™ has a wide, adjustable shoulder strap for comfort. It holds 36 ounces of water and is dishwasher safe. Traveling with your pet has never been easier! Pets need lots of water to maintain and promote healthy kidney and urinary tract functions, particularly during the hot summer months or while taking long walks. If you are tired of sharing your water with your pet, then you need the Hydro-Go. With this unique water bottle you will never have to worry about your dog's slobber again. This product is a must-have for any pet owner who enjoys taking their animals for walks, bringing them to work, or just hanging out with friends. It expands into a water dish that will lay right on the ground. THe bowl and canteen fit together perfectly so you can easily pour water in both directions without spilling. Give your active dog fresh water anytime, and anywhere. The Hydro-Go is a cleverly designed canteen and dog bowl in one. With this unique unit, you never need to worry about the quality of water your pet is drinking because you are bringing it with you. Your pet will love it too. They will thin they are getting a treat because they have a canteen all of their own. The detachable bowl flips out for use and then snaps back in for storage. With this great canteen, it is easy to conserve unused water. The advanced design allows you to simply tip it to pour water from the bowl back into the canteen. An extra wide spout makes filling it quick and easy and gives the added benefit of being able to add ice cubes for cooler water. For feeding and watering, just remove the water bowl from the canteen and then the back side of the canteen can be used as a food dish. Now you have two bowls and a complete travel system for your pet. A wide carrying strap fits over your shoulder or adjusts to fit easily around your waist for walking or hiking. The canteen features a large 36 ounce capacity. The Hydro-Go is quite simple, but once you use it, you will love it. This item is a "must have" for pet owners worldwide. Clean-up is easy since it is dishwasher safe. Order Yours Today! Strap Length 12" - 45"
Hydro-Go Pet Canteen - A convenient way to give your pet water on the go. This great canteen will even separate to create two bowls. A must have for all pet lovers! Order Yours Today! The Sanitary Yard Scoop For Your Dog's Little Messes.